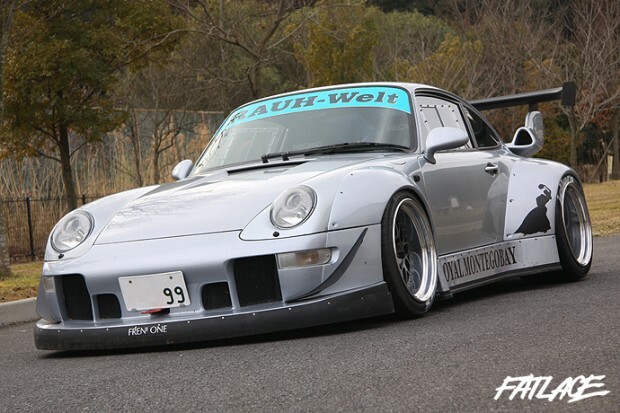 RWB has in the last 12 months become a global tuning sensation, the work of Nakai-san has amassed legions of fans, as well as a few with differing opinions. A little over 12 months ago I took a trip to a small tuning garage, unaware that my outlook on tuning was about to be changed forever. 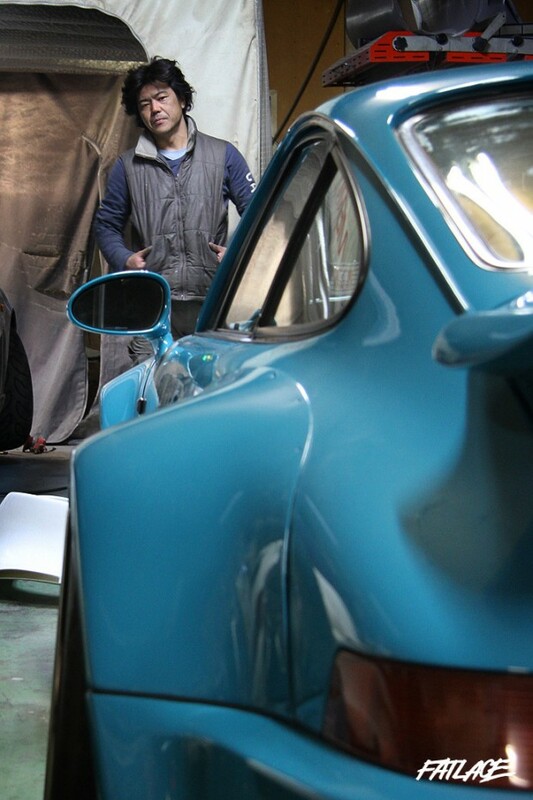 The ‘rough’ world of RWB and it’s creator; Nakai-san are a mix of polarisation, twisted & tormented artist, and pure inspiration. So what is it about RWB that has ‘changed my views’ you might ask? It’s just another car tuner isn’t it? Well for most who see this tuning marque from behind a PC screen, maybe. I was lucky to be adopted into the ‘RWB family’ and spend a lot of time with not only Nakai-san, but the customers and people that make RWB the tight-knit community that it is. The one thing that is very obvious right-away regarding RWB is that it’s not primarily the cars that make this marque great, it is first and foremost the people. 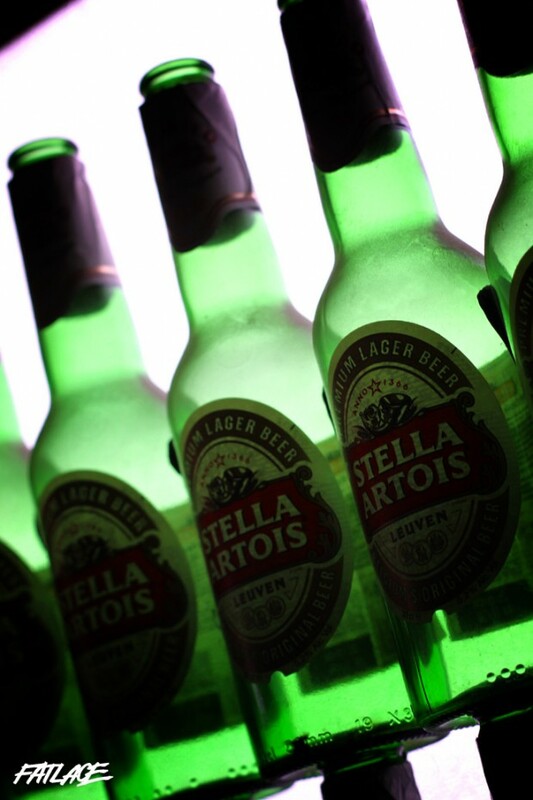 The different backgrounds, personalities, and tastes when all brought together are a recipe for very memorable times. The RWB end of year party is a perfect example of just that! 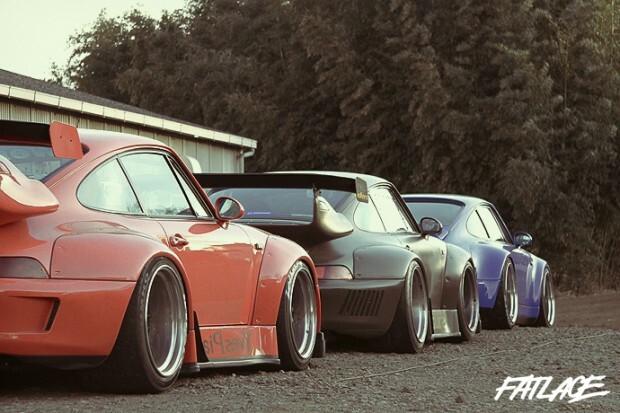 Whether you are a RWB owner or a photographer, you will be welcomed with open arms. Back on the workshop end of things, perfecting on perfection is not an easy thing to do. There is only one word to describe Nakai-san; ‘artist’. The RWB build philosophy is like no other. You won’t find any CAD drawing programs on computers here, in fact you won’t even find a pencil and paper with sketches. Every part of the build-process is purely inspirational and is etched firmly on his brain, sometimes it might take time for build inspiration to come to him. For maximum efficiency he works by night and sleeps by day so his creative process isn’t interrupted. Where does this inspiration come from you might ask? Something as simple as his favourite beer is enough to inspire a build, a name for a car, and even the differing elements of the car itself. 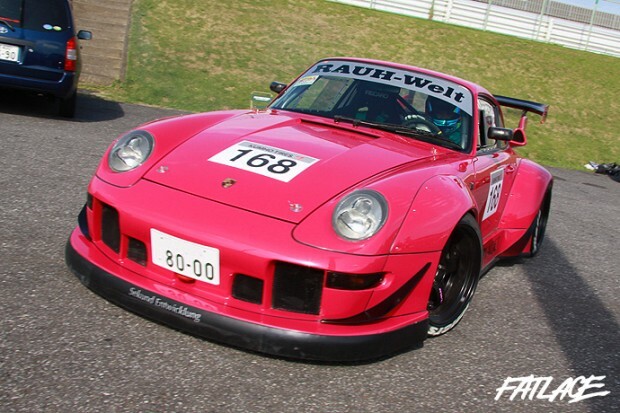 ‘Stella Artois’ is the first and last RWB according to Nakai-san. 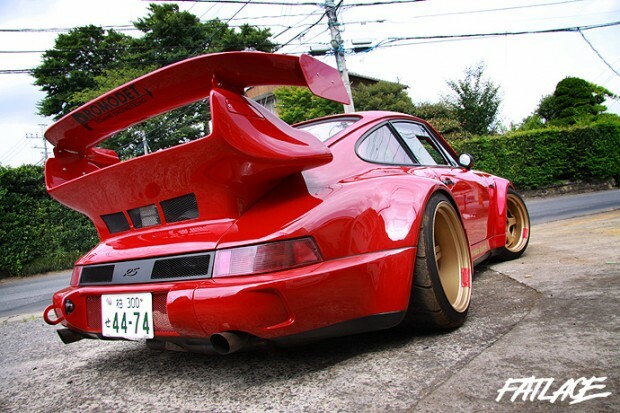 Named after his favourite beer, this 930 is certainly larger than life, it is as much as part of RWB as Nakai-san. 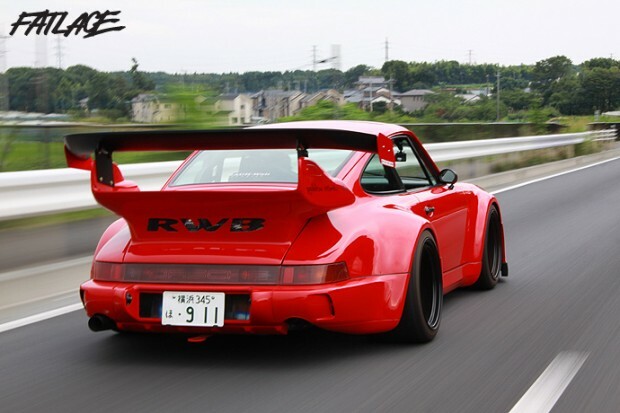 All RWB’s are individually named according to the owner’s character. The final touch put on them before they roll out of the workshop. I have had many opportunities to observe Nakai-san working, often he will just sit quietly with a lit-cigarette inhaling and exhaling while staring intently at a car, waiting for direction. When one cigarette is finished he will light up another, and then all of a sudden he will stand up, grab a angle grinder a cut away a part of a customers pride and joy. There is certainly no ‘undo’ button in this line of work and yet he never has second thoughts while working, he sees everything crystal clear. This 993 is certainly a far cry from how it rolled into the workshop. It certainly takes a true artist to visualise this while looking at a standard machine. For anyone who has ever visited the workshop they will agree that this is one of the coolest workshops anywhere. 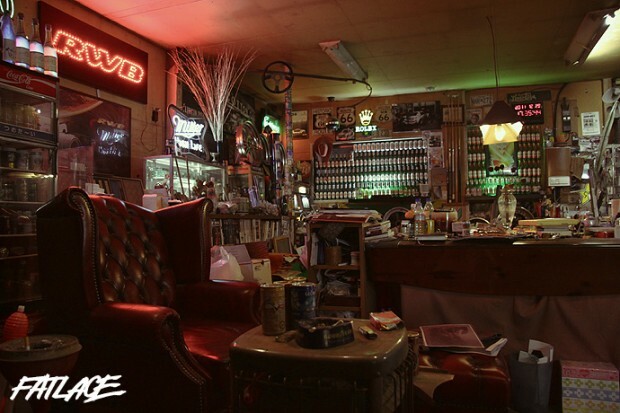 Souvineers, trinkets, memorabilia of previous cars and races, as well a photographic timeline wrapped around the walls make this one lively building. If you can’t feel inspired sitting here then you surely aren’t alive. 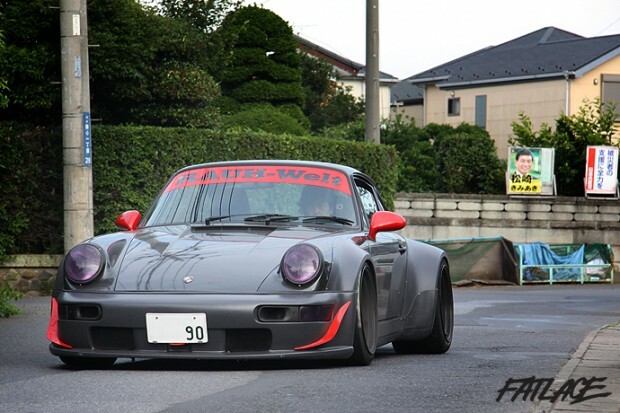 I remember asking Nakai-san on my first visit what he think separates RWB from other tuner companies. He replied with ‘I have never been influenced by peoples opinions, I did exactly what I wanted, and I’m influenced only by my own love of driving cars. This is why my Porsches are how they are’. Shinji’s ‘Good Hills Speed’, was entrusted entirely to Nakai-san. The blood-red and gold combination is pure heaven on the eyes. The cars are just as much at home being driven in anger on a track as they are cruising the Wangan. 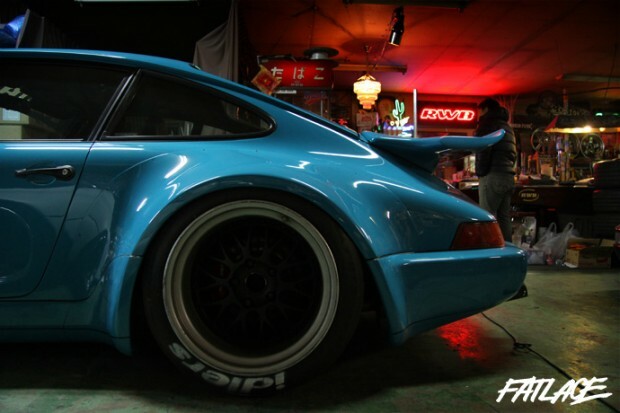 Toshi from RWB stated that “RWB’s can be taken out and raced hard by day on a circuit, then you can go and park them outside a big swank casino by night’. They are not just a one trick pony by any means. 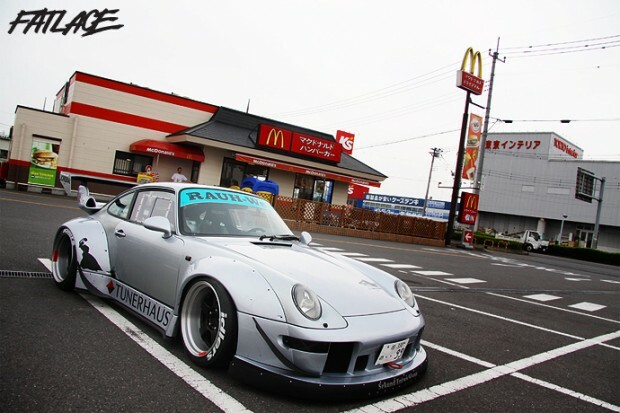 The boss is a man of habits too, Idler’s race meetings are always started off with a meet and greet at Moriya Parking area, and then a good ol McDonald’s coffee and McMuffin. No need for the fancy-blend stuff, this is ‘rough’ world after all. ‘I won’t be stopping smoking either’ he laughs in between puffs on a lit Winston cigarette. This particlar 993 has a full cage, race stripped interior and all the running gear from a GT2 race car. The real McCoy. 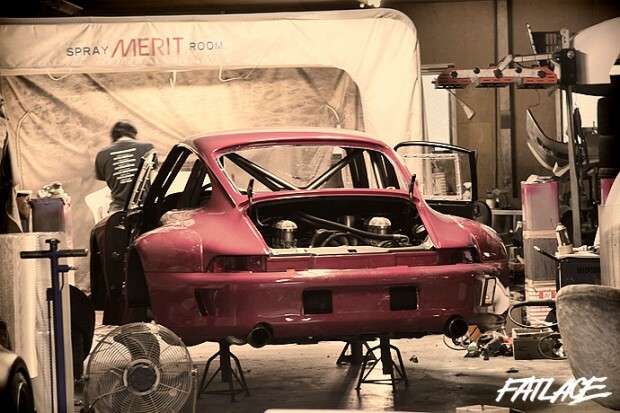 However despite how many seem to think, RWB is NOT made up of professional racers, Shimizu-san is a builder and simply has a passion for cars. Just the majority of the other RWB owners. After a few visits and some long talks with Nakai-san, I found myself being influenced by him also. He has been a great help on how I look at photography, and was a big help in focussing my photographic eye. This particular 993 is now onto it’s 3rd makeover. 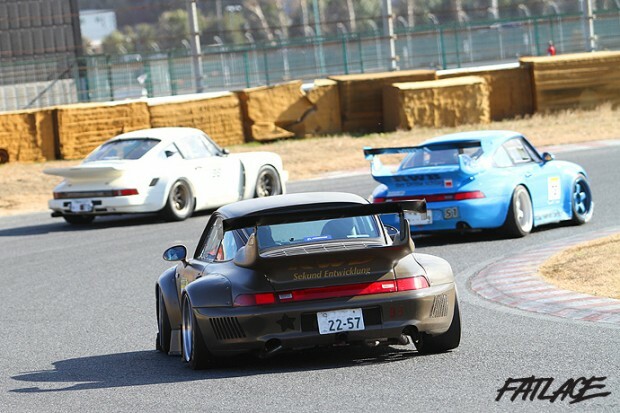 As Nakai-san’s visionary changes, so too do his personal RWB’s. This one started life as Afromania, then was changed up to Amazonia, and is now matte brown and named after a street in Thailand, which took his fancy on a trip there. 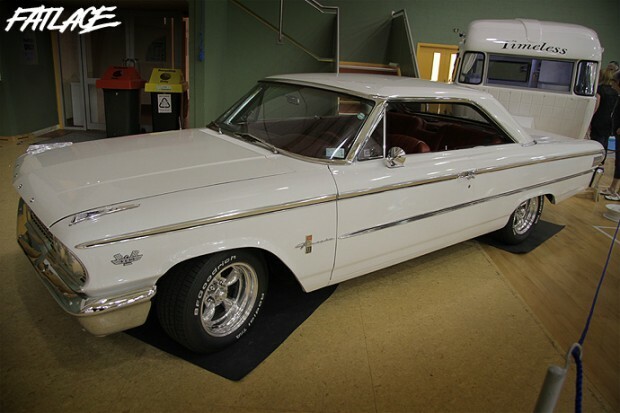 The paint is mismatched, the petrol gauge doesn’t work, it rides super-stiff, and the windows are ill-fitting plexiglass, but I would take this car out of the garage over many other ones any day that is for sure! It’s finished, although the amount of times he stands back trying to pick flaws in his own work to ensure perfection is staggering. After all, an artist is how own worst critic. Nothing but the best. Now that more and more global interest and builds are coming in, Mr Nakai’s personal RWB’s now spend more and more time sitting outside next to the workshop as opposed to inside it. 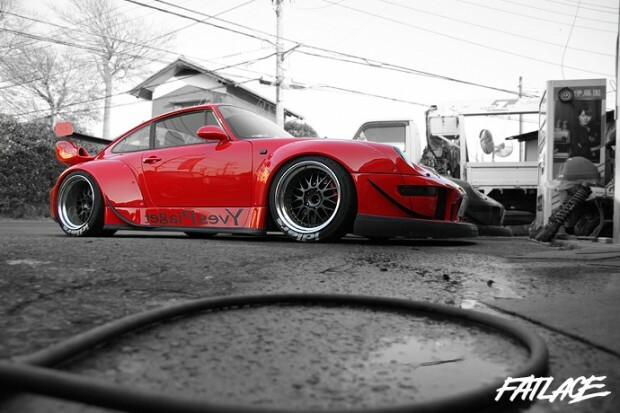 Such is the success of RWB outside Japan, that he almost spends more time out of Japan than in the workshop. What was meant to be a simple one-off magazine article has ended up being a multitude of long-lasting friendships with great people. 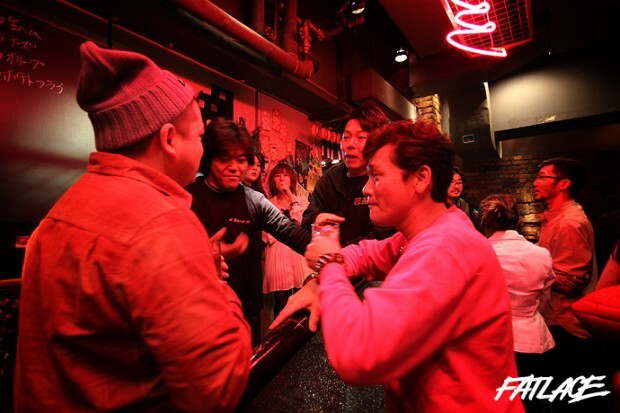 Nakai-san, Shinji-san, Pogi-san & Ishii-san are a bunch of top notch blokes. Not to mention the countless other good friends I have made through RWB! I was trying to find a photo on which to end this post and this was the one that jumped out at me. It’s a workshop designed perfectly to fit Nakai-san. Nothing seems to be in it’s right place, pieces of cars and tools are all over the place, however in amongst this chaos he always knows exactly where everything is. Then sitting outside is Yves Piaget, one of the cleanest, and aesthetically stunning cars I have ever seen. The best way to describe this workshop really is ‘diamond in the Rauh’. Great inspiring article! Read the whole thing from start to finish, kind of reminds me of my dads garage. It may be the most un-organized place to work on a car, but we always get it done and the memories of using my dads tools and working with him are priceless. Inspirational thanks for showing us this insight, more companies and people could learn a lot from this, especially how many companies are disconnected from their customers only interested in money and not what their company and morals are about, they might earn more money if they did, word spreads fast good or bad.